Ary Scheffer (1795–1858), Faust and Marguerite in the Garden (The Seduction) (1846), further details not known. Wikimedia Commons. Fuelled by a witch’s rejuvenating brew, Faust wants to seduce a young girl, Gretchen, whom he bumps into in the street. Mephistopheles tells him it’s not quite as quick and easy to set up as Faust wants, but under pressure promises to take him to the girl’s room later that day. That evening, Gretchen (Margareta) is wondering who the man was that she bumped into in the street. As soon as she leaves her room, Faust and Mephistopheles enter it. Faust’s imagination runs riot, particularly when he sees her bed. As the girl is about to return, Mephistopheles produces a box of jewellery which he has ‘acquired’, and places it in Gretchen’s cupboard for her to discover. The two leave in haste. Gretchen returns, and sings a song as she undresses. She goes to put her clothes in the cupboard, where she discovers the jewel box. When she opens it, she is taken aback at the beauty of the jewellery, which she tries on. In Scene 12, Faust is walking up and down, in thought. Mephistopheles arrives and tells him that Gretchen’s mother gave the jewels to a priest, saying to her daughter that ill-gotten gains would do her no good. Faust tells Mephistopheles to get Gretchen more jewels, and to get to know the woman who lives next door to the girl. The next scene opens with the woman next door, Martha, telling the audience how her husband had ill-treated her, then went away and hasn’t been seen again. She says that she needs his death certificate, and on that Gretchen enters to report that she has just found a second jewel box. Martha instructs her not to tell her mother, but to bring the jewellery to her when she wants to wear it in front of the mirror. Alexander von Liezen-Mayer (1839-1898), Gretchen and Marthe (c 1868-72), engraving after, further details not known. Wikimedia Commons. 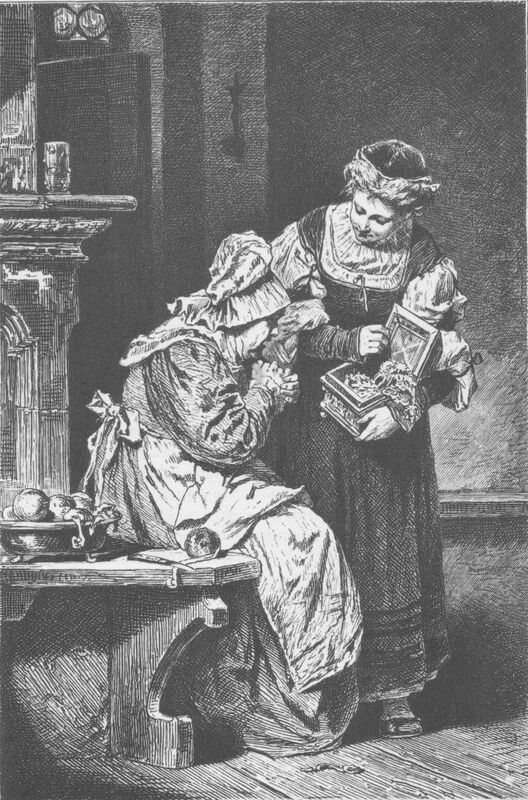 It is perhaps this moment which is shown in Alexander von Liezen-Mayer’s Gretchen and Marthe, from about 1868-72, seen here in an engraving. Mephistopheles then turns up at the door, claiming that he is looking for Martha. He says that has sad news, that her husband is dead. Martha asks where his possessions are, but Mephistopheles assures her that he had none, before making an aside to Gretchen that, if she’s too young to marry, she should take on a lover. Dieudonné Raphaël Bourdier (1794-1865), Gretchen and Mephisto (date not known), oil on canvas, 46 x 38 cm, Private collection. Wikimedia Commons. Dieudonné Raphaël Bourdier’s undated painting of Gretchen and Mephisto shows a caricature of the devil talking to the two women. Behind Gretchen is the second jewel box, some of whose contents she is already wearing. Eugène Delacroix (1798–1863), Mephistopheles Visits Gretchen (1828), lithograph, further details not known. Wikimedia Commons. Eugène Delacroix’s lithograph from 1828 shows Mephistopheles Visits Gretchen, with Martha and the box of jewellery. Mephistopheles gives more details of the death of Martha’s husband, and before he is allowed to leave, the widow asks him for documentary evidence. Mephistopheles arranges a meeting that evening in Martha’s garden, to provide the certificates for Martha and introduce Faust to Gretchen. Mephistopheles returns to Faust and explains how the two of them need to forge paperwork attesting to the death of Martha’s husband. Faust protests that this is dishonest, but Mephistopheles reminds him that he has lied before. Faust angrily accepts that he has no choice. Eugène Delacroix (1798–1863), Faust Trying to Seduce Margarete (detail) (1828), lithograph, dimensions not known, Musée National Eugène-Delacroix, Paris. Wikimedia Commons. 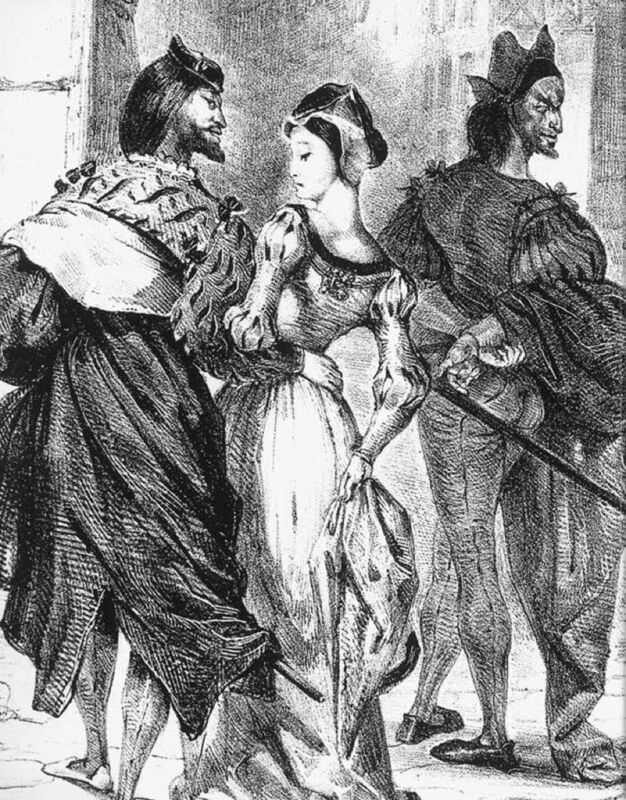 Delacroix’s lithograph from 1828 shows Faust Trying to Seduce Margarete. Scene 15 opens with Faust and Gretchen walking up and down the garden, as Martha talks with Mephistopheles. 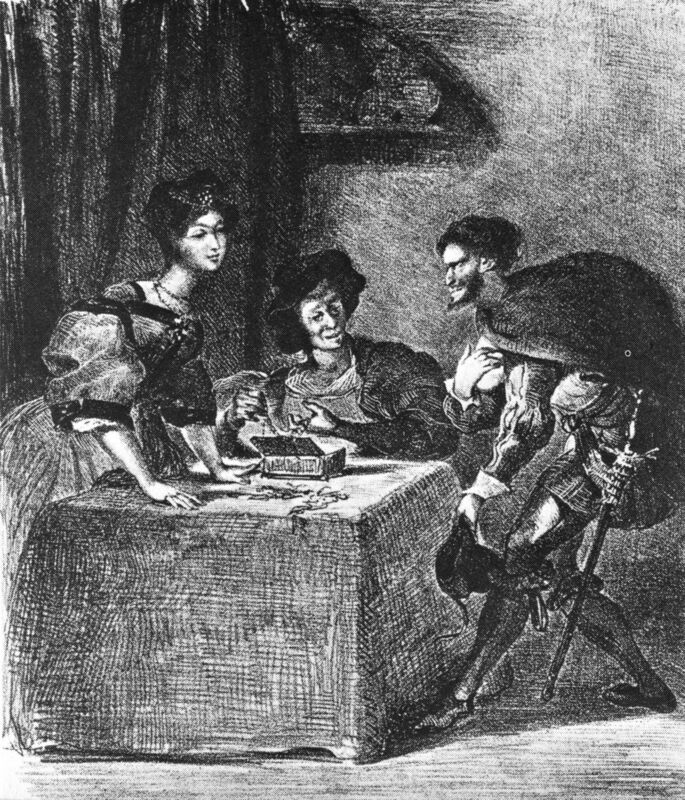 Gretchen explains to Faust that she is alone much of the time, as her brother is serving away in the army, her little sister died, and she is left to run the house on her own. Mephistopheles tries to explain to Martha that he is a bachelor and has no interest in the love of women. 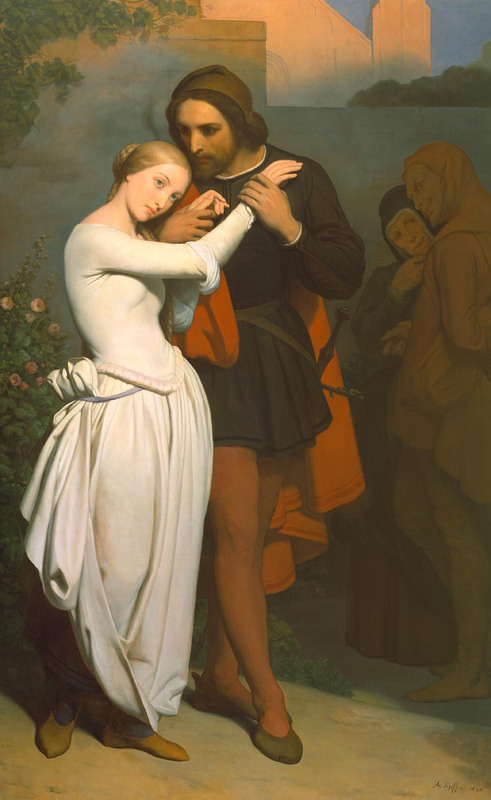 Ary Scheffer’s painting of Faust and Marguerite in the Garden (The Seduction) from 1846 captures this masterfully, with the dreamy Gretchen and Faust almost dancing together, as Martha tries to interest Mephistopheles in her rather than the young couple. 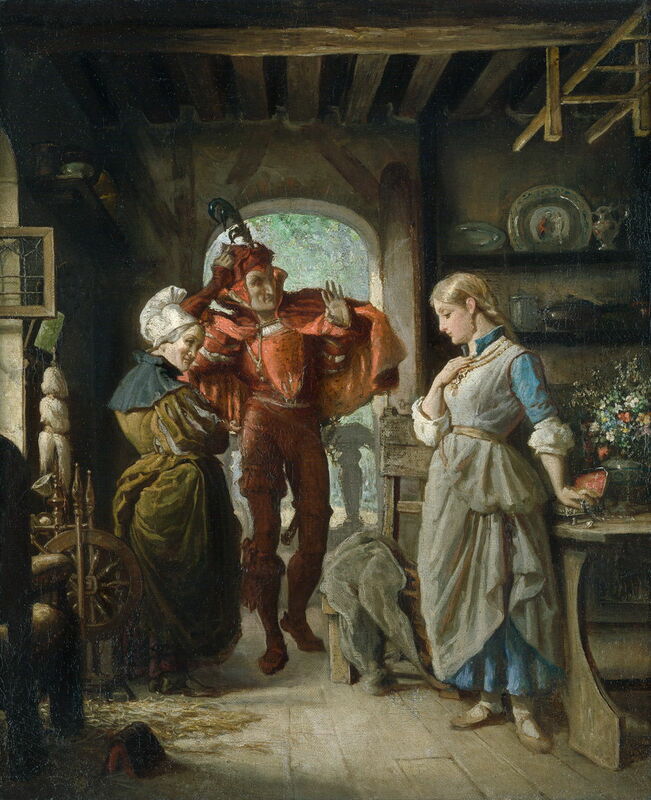 Hendrik Frans Schaefels (1827–1904), Scene from Goethe’s Faust (1863), oil on panel, 79 x 62.5 cm, location not known. Wikimedia Commons. 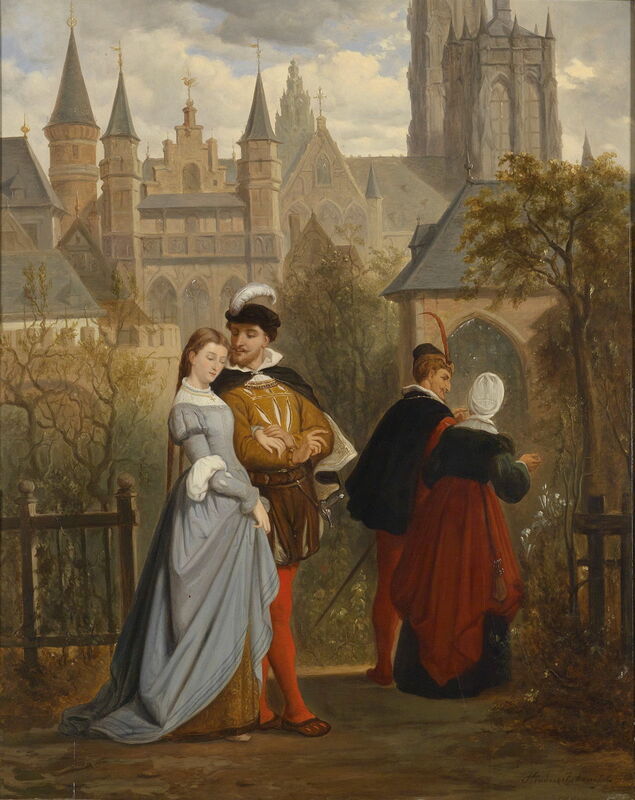 Hendrik Frans Schaefels also shows this in his Scene from Goethe’s Faust from 1863. Mikhail A Vrubel (1856–1910), Faust and Margarita in the Garden (sketch) (1896), watercolour and pencil on paper, dimensions not known, Latvian National Museum of Art Latvijas Nacionālais Mākslas Muzejs, Riga, Latvia. Wikimedia Commons. 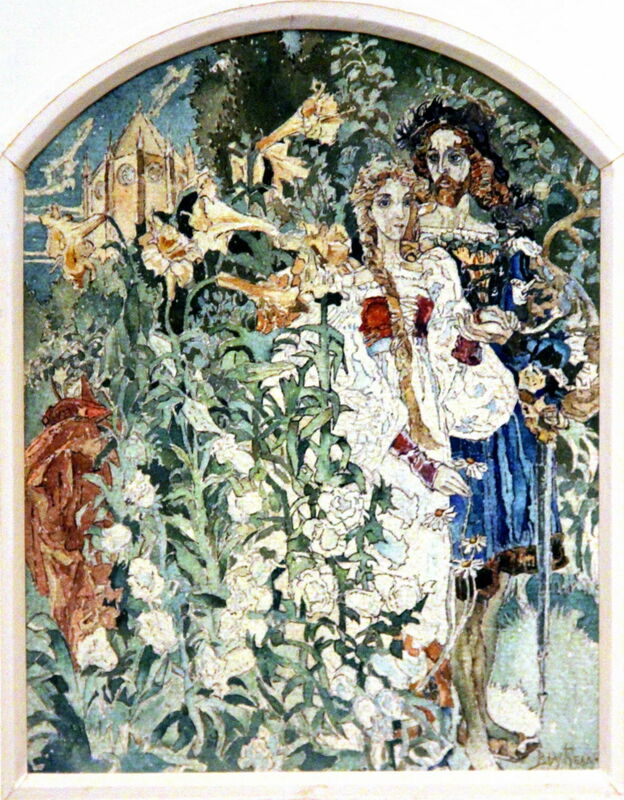 Mikhail A Vrubel’s remarkable watercolour sketch of Faust and Margarita in the Garden from 1896 was made in preparation for a finished painting which I have been unable to locate. James Tissot (1836-1902), Faust and Marguerite in the Garden (1861), oil on canvas, dimensions not known, Musée d’Orsay, Paris. Wikimedia Commons. 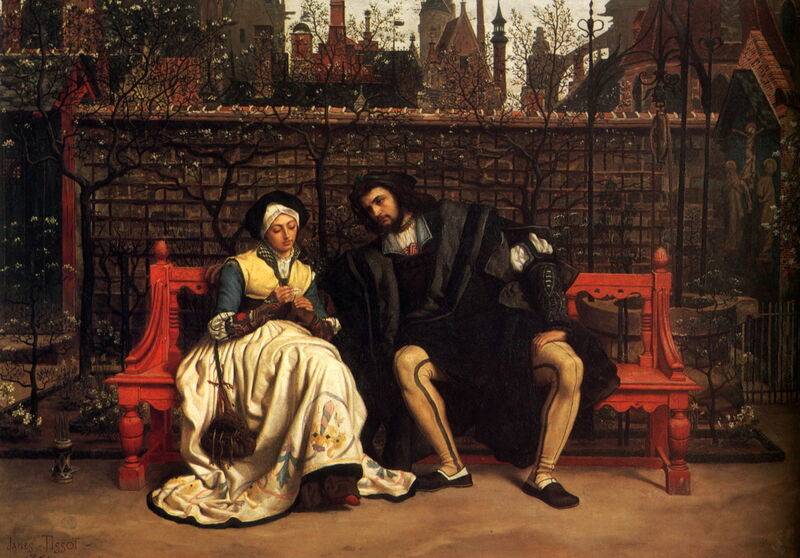 James Tissot’s Faust and Marguerite in the Garden from 1861 is based on Gounod’s operatic retelling, and shows the couple sat talking together on a bench, still quite distant, with Gretchen looking intently at a daisy she is holding. Gretchen pulls the petals off the daisy with the childhood words ‘he loves me, he loves me not’, and when she removes the last petal rejoices in saying “he loves me!” She and Faust clasp hands at this before she runs away from him. Gretchen runs behind the door of a summerhouse, where she hides from Faust. He catches her, and they kiss. Martha and Mephistopheles arrive shortly afterwards and tell Faust and Gretchen that the men must leave. Their departure ends the scene. Scene 17 is set in a cavern in the forest, where Faust addresses the ‘sublime spirit’, and thanks it for his love of Gretchen. Mephistopheles arrives, and the two trade insults for a little, with Mephistopheles questioning why Faust seeks such wild places, and he reminds Faust that young Gretchen is pining for him. Faust grows angry at Mephistopheles’ taunting, calling him (appropriately) a snake. Faust regains his lust for the young girl. Meanwhile, Gretchen is sat alone at her spinning wheel, singing of her yearning for Faust and his love. Georg Friedrich Kersting (1785–1847), Gretchen Before the Mirror (1827), pen, pencil, watercolor and gouache, 24.5 x 18 cm, Museum der bildenden Künste, Leipzig, Germany. Wikimedia Commons. 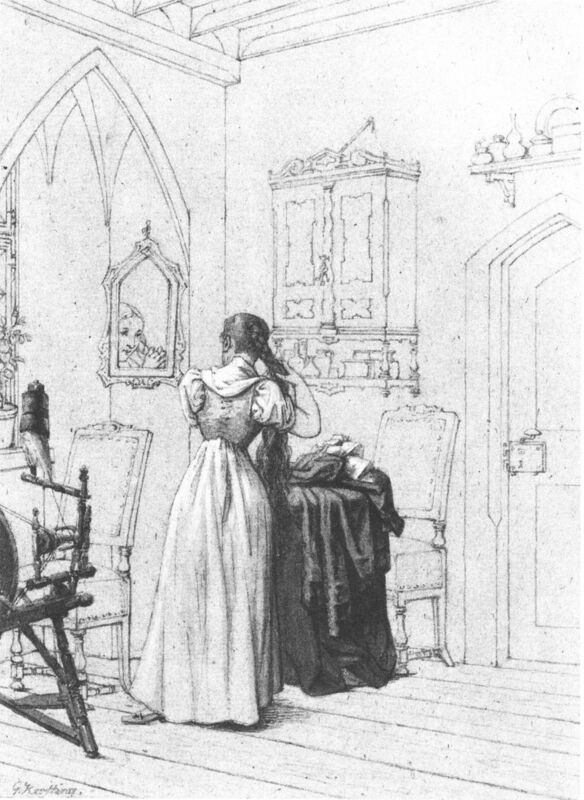 Georg Friedrich Kersting’s sketch of Gretchen Before the Mirror from 1827 shows Gretchen alone with her spinning wheel. Scene 19 returns to Martha’s garden, where Gretchen and Faust are together. She asks him to tell her of his views on religion, but Faust is evasive. She complains that, while he may respect the sacraments, he doesn’t attend Mass or Confession. Then she asks whether he believes in God, forcing Faust to be even more evasive, talking about an ‘earth spirit’. Gretchen next expresses her hatred of Mephistopheles, forcing Faust to try to excuse him as just being a bit odd. Gretchen tells Faust that she must go. He pleads with her to allow him to spend some time with her that night, but is told that Gretchen’s mother sleeps very lightly and must not be woken. For this, Faust provides Gretchen with a potion, three drops to be given to her mother to ensure that she sleeps soundly. Gretchen questions whether her mother will wake safely, saying that she has already done so many things for Faust that there seems little left. 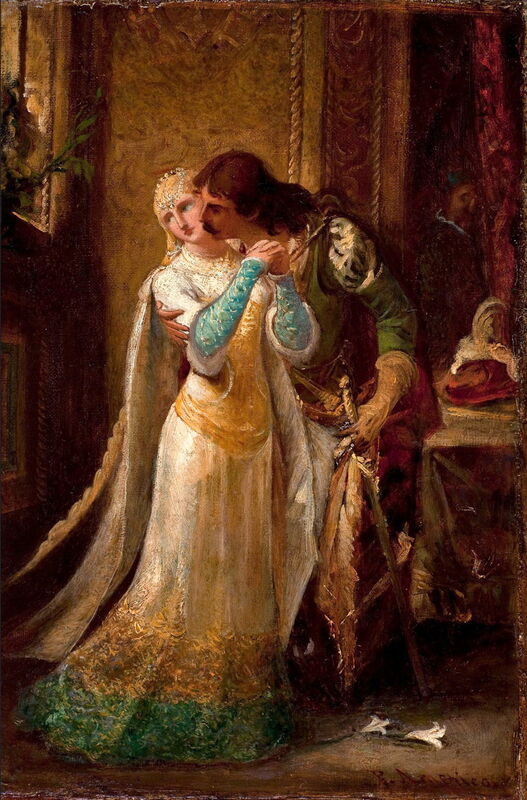 Pedro Américo (1843–1905), Faust and Gretchen (1875-80), oil on canvas, 34 x 23 cm, Pinacoteca do Estado de São Paulo, São Paulo, Brazil. Wikimedia Commons. Pedro Américo’s Faust and Gretchen from 1875-80 is again probably based more on an operatic version. The shadowy figure of Mephistopheles is eavesdropping behind the curtain at the right, and white lilies, a symbol of virginity, lie fallen on the floor. Gretchen then leaves, and Mephistopheles promptly appears. He and Faust trade insults before Mephistopheles asks whether the couple will make love tonight. Faust asks him what business it is of his, to which Mephistopheles says that he will take a certain pleasure too. Posted in General, Life, Painting and tagged Américo, Bourdier, Delacroix, Faust, Goethe, Kersting, Mephistopheles, painting, Schaefels, Scheffer, Tissot, von Liezen-Mayer, Vrubel. Bookmark the permalink.